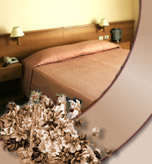 Venice Hotel is a blend of European style and Russian hospitality. Twenty-four hour security provides safe environment for our guests. Our guestrooms offer special comfort and modern services to meet the needs of the business and leisure traveller. Each standard hotel room is furnished with comfortable bed, working desk, private bathroom with toiletries, satellite and in-house TV, IDD telephone, video player, individual safe, minibar and Wi-Fi Internet. All rooms have central air conditioning and heating. Non-smoking rooms are available. We offer Single rooms (a room with one super-single size bed - USD97.00 per night), Twin rooms (a room with two super-single size beds - USD122.00 per night), Double-bed rooms (a room with one queen size bed - USD134.00 per night) and Deluxe rooms (a room with one queen size bed and a sofa - USD151.00 per night). Room rates do not include breakfast. The cost of breakfast is USD 6.00 for continental and USD11.00 for American breakfast. In a meeting room, in its cozy atmosphere, our guests can comfortably expect their flight, or have talks with the friends or business-partners. The meeting room is the best place for official functions, small seminars, business or private meetings. Business centre services such as Internet, typing, faxing, photocopying and printing are available to help you manage your business needs.